Long life, trouble free and user friendly operation. The compact Posiflex PD302B customer display provides a green color LCD display, offering two (2) lines with 20 characters per line. 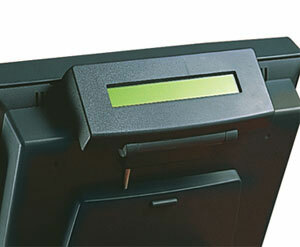 The PD302B is a rear-top mount display for the TP Series. Sleek and unobtrusive, this integrated 2X20 LCD rear top mount customer display is ideal for all market segments from hospitality to retail in a cashier, quick-service, convenience store or kiosk setting. The display is available for all KS, FT, and TP series terminals.